Mobile Suit Gundam Extreme VS, the tenth game in the Gundam VS series, is the most popular home and portable console fighting game of this generation in Japan. It's also practically unheard of in the West. And while those outside of Japan may think that Extreme VS is nothing more than a cheap tie-in game, leeching off the success of its brand name, it really is a lost gem that gamers the world over are missing out on. Extreme VS is not like most 2D fighting games—or 3D fighting games, for that matter. It shares much more in common with Sega's Virtual On than Street Fighter, except for in one major category: polish. Indeed, the best thing about A-tier fighting series is how the games get progressively more polished after each iteration. By the tenth iteration, needless to say, this series is very well polished. And it's thanks to that polish that Extreme VS is a fast, tight, balanced fighting game with over fifty diverse characters in its roster. course, this also means that some Gundams are far more powerful than others. To balance this, each Gundam costs a certain amount of points. If your Gundam is destroyed in battle, that amount of points is subtracted from the team's communal healthbar and you get a second life. But if there are not enough points left in the team's lifebar to respawn your unit when you die, the other team wins. This means that if a team chooses Strike Freedom Gundam and ν-Gundam, for example, they would have only two deaths between the two of them. If however, they choose suits from the 08th MS Team, they could have as many as six deaths total. Extreme VS is definitely designed as a two versus two fighting game, but that doesn't mean it doesn't deliver on the single player content as well. There are literally hundreds of missions of varying difficulty that allow you to reenact all your favorite scenes from across all the different Gundam series. As you play through these, you level up your favorite Gundam and unlock new emblems for multiplayer—on top of CG cutscene reenactments of some of the franchise's greatest fights. And this is all in addition to the normal single player arcade mode. this game out of the park: the soundtrack. Extreme VS includes licensed music from every one of the included anime series. These are most often the opening or ending themes to the respective series and are used in mission mode to signal the identity of your opponents. Of course, the oddest piece of fan service is the opening to the game itself: a giant all out Gundam melee with soundtrack my Linkin Park. Whether playing single player or online, you will always have a partner; so building your team around the costs of your suits as well as their type (melee. ranged, etc.) is essential. In battle, team work is even more important. Simply trying to pair off into two one-on-one fights is just asking to get shot in the back—and neither the computer nor other players will let you get away with it. And since a single well-placed melee combo can bring most Gundams to half life, it's important to know when your partner is in one so you can interrupt it with a well-timed shot. Mixed — Prepare to be destroyed. Constantly. Like most fighting games, the vast majority of the players who play online are good. Very good. Your first time playing you will be lucky to even hit your opponent once. It takes a lot of practice and a good partner before you start winning even the occasional match online—and this may simply be far more time than casual players are willing to put in. 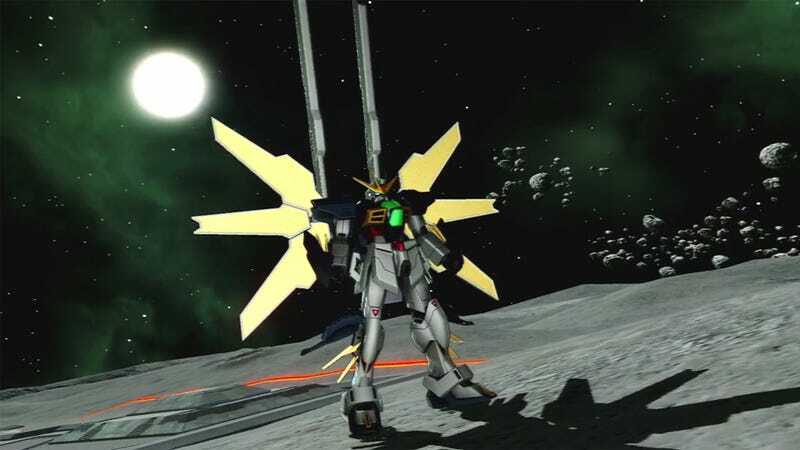 Gundam Extreme VS is a masterful fighting game for fans and non-fans alike. If you're looking for a fighter unlike the Soul Caliburs or Tekkens of the world, I cannot recommend this title enough. While it is most likely never coming to the West, it has very little Japanese and can be played on any PS3 system worldwide. So import away. Gundam Extreme VS was released in Japan on December 1, 2011 for the PlayStation 3. There are currently no plans for an international release. When people think of Japanese fighting games, they think of Street Fighter, Tekken, King of Fighters and BlazBlue. But would it surprise you to know that one of Japan's most popular fighting game series hasn't made it out of Japan since the GameCube era?